During the month of September I will be featuring a series of articles on this topic. 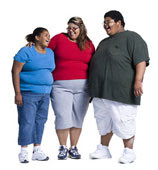 One out of every five children under twelve in the United States are overweight or obese. We all can do our part to prevent our children from being part of those statistics. Education – If parents are educated on how to make healthier lifestyle changes they will have a better understanding of how to help their children lead healthy, happy lives. Awareness – Parents need to be aware of the statistics and what can happen to their children’s health if they become a part of those statistics. Parents need to know how important it is to keep kids healthy. Our future depends on it! Example – Parents must lead by example. If we don’t eat healthy foods, provide healthy foods for our families and exercise what are we teaching our children? Create a lifestyle that encourages your children to be healthy. Teach them the importance of healthy eating and exercise. When your child goes to a Birthday party he usually brings home a “goodie bag.” Most goodie bags from childrens’ parties are filled with high calorie, sugary treats. Moms who are concerned about their child‘s health are not going to appreciate the snacks in the bags. Pump it Up, the nation’s largest franchise of indoor inflatable playgrounds has introduced fun goodie bags with out the high calorie treats. The new Goodie Bag was developed after Pump It Up commissioned brand marketing firm C|3 (Creative Consumer Concepts) to determine what moms and kids are really looking for in their goodie bags. As a result of extensive research, they found that while 90 percent of moms view the goodie bag as a necessary element of a birthday party, it is also the most stressful part of throwing the celebration. Included in these goodie bags are a roto launcher, sidewalk chalk and thunder sticks, and either a disc launcher or inflatable ball, depending on the franchise location. Moms are welcome to add other items of their choice. The launch of the health-conscious bags coincides with Pump It Up’s membership in the Coalition for Healthy Kids, a national campaign addressing childhood obesity in America . The campaign is spearheaded by the Advertising Council, a non-profit organization that develops public service campaigns to address critical social issues. Related What's The Worst Candy Kids Eat On Halloween? I was happy to try these new goodie bags out with my 3 year old son and 4 and a half year old daughter. They enjoyed playing with the toys and I think that these goodie bags are a neat concept. Even though most moms believe it is important to give away goodie bags at their child’s Birthday party, I stopped doing this once my second child was born. Goodie bags can get expensive and I would rather give children balloons, Birthday hats and blowers. If a parent insists on giving away goodies to party goers then the Pump it Up goodie bags will work out quite nicely. I also think that parents can design similar goodie bags by purchasing items from their local dollar store. Parents can choose whether or not to put sugary treats in Birthday goodie bags. Of course I would choose to leave them out. Do you give away goodie bags at your child’s Birthday parties? Would you prefer to hand out goodie bags similar to the Pump it up ones or do you include sugary snacks? A clear leader in the active children’s party industry, Pump It Up is the nation’s largest franchise of indoor inflatable playgrounds specializing in private parties for birthdays, and other programs like corporate events, school outings, field trips and other events. Trained staff provides guests with supervision, food and beverage set-up, and clean-up services. Pump It Up is headquartered in Tempe , AZ with more than 160 locations across the country. For more information about Pump It Up, please visit www.pumpitupparty.com. Related Why Does the Scale Say That?